"I Want to Be Loved"/ "Going to New York"
(1959) "Baby What You Want Me to Do"
(1959) "Found Love"/ "Where Can You Be"
"Baby What You Want Me to Do" (sometimes called "You Got Me Running" or "You Got Me Runnin'") is a blues song that was written and recorded by Jimmy Reed in 1959. It was a record chart hit for Reed and, as with several of his songs, it has appeal across popular music genres, with numerous recordings by a variety of musical artists. Backing Reed are his wife Mary "Mama" Reed on harmony vocal, Eddie Taylor and Lefty Bates on guitars, Marcus Johnson on bass, and Earl Phillips on drums. Calvin Carter (Vee-Jay record producer): What's the name of this? Mama Reed: "Baby What You Wanna Let Go." Carter: No, "Baby What You Want Me to Do." "Baby What You Want Me to Do." Mama & Jimmy Reed: "Baby Why You Wanna Let Go." 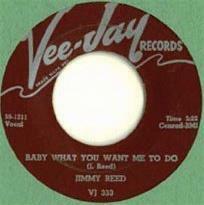 Jimmy Reed: You could even make it "Why Let Go." Make it short. "Why Let Go." Of note, nowhere in the song do the lyrics "baby what you want me to do" appear, although later cover versions would often wrongly include the phrase in place of the original "baby why you wanna let go." "Baby What You Want Me to Do" was included on Jimmy Reed's second album Found Love (1960), the Jimmy Reed at Carnegie Hall album (1961), as well as numerous compilation albums. "Baby What You Want Me to Do" reached number 10 in the Billboard R&B chart and number 37 in the Billboard Hot 100 in 1960. In 2004, Reed's song was inducted into the Blues Foundation Hall of Fame in the "Classic of Blues Recordings" category. 1964 – Billy Fury, B-side of "It's Only Make Believe"
1964 – Johnny Rivers from Here We à Go Go Again! 1967 – Little Richard as "Anyway You Want Me" in the medley with "You Don't Have to Go" from Little Richard's Greatest Hits: Recorded Live! ^ a b Romano, Will (2006). Big Boss Man: The Life and Music of Bluesman Jimmy Reed. Backbeat Books. p. 113. ^ "Jimmy Reed – song review". ^ Herzhaft, Gerard (1992). "Baby What You want Me to Do". Encyclopedia of the Blues. University of Arkansas Press. p. 437. ^ "Song Search Results for Baby What You Want Me to Do". ^ The SessionJerry Lee Lewis, Retrieved April 7, 2012.